Since the start of August 2014, we assemble ochs und junior’s watches right here in Lucerne! To execute Ludwig Oechslin’s uncompromising innovations and to thrive in an industry dominated by large companies with considerable financial means, how we use our financial and human resources is crucial for a small, but uncompromising watch company like ours. All core competencies in development, communication, customer service and sales are handled internally at ochs und junior. All essential production steps have been delegated, since the very beginning, to extremely competent partners who are among our close friends. All parts are manufactured by Peter Cantieni in Hinwil, Switzerland. We thus profit from his competence and skills spanning several industries. He offers us the unique possibility to order custom parts of the highest quality in even the smallest batches. Since 2011, Marion Müller has executed all watchmaker’s tasks in Kappel am Albis, Switzerland. As a master watchmaker, she was – and still is – the guarantor of our access to the highest level of skills while providing a flexible cost structure. This was particularly important when we took the final step to becoming an independent watch company with its own workspace at Zürichstrasse 49 in Lucerne. Thanks to our worldwide clients, our friends, and perhaps we could even say, our fans, we were able to create a healthy base in the past two years, since taking that step to independence. On top of that base, we are now taking the next step – that of incorporating the different watchmaker’s tasks within our company structure. 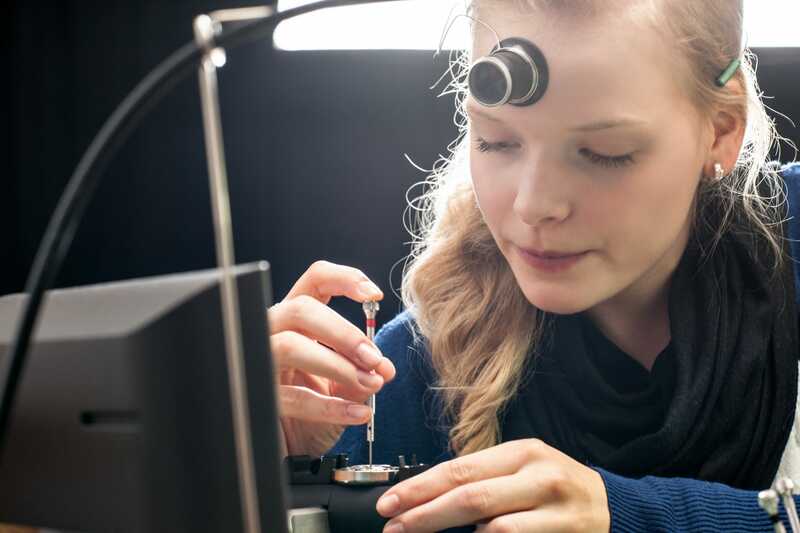 Sandra Flück has completed her four year apprenticeship as watchmaker and clock restorer at the watchmakers’ academy “ZeitZentrum” in Grenchen, Switzerland this summer. For her final piece of work, a pocket watch that she built, she received the highest possible grade. She has been working in the newly set up watchmaker’s atelier in the ochs und junior workspace at Zürichstrasse 49 in Lucerne. She is responsible for assembling our watches. In La Chaux-de-Fonds, Sandra assembles prototypes developed and milled by Ludwig Oechslin, and acts as his technical assistant. Here in Lucerne, Sandra tests these prototypes and assures that repairs and services are taken care of quickly and efficiently. Our goal is to have a watch back on our client’s wrist within 10 days. To further develop not only her understanding of Ludwig’s conceptually innovative work, but also her technical skills as a watchmaker, she furthermore executes special projects for ochs und junior. Currently she is working on building a pocket watch for a client here in Lucerne. Thus we now use the 180 square meters at our disposal for Bea Weinmann’s photo studio, as Cail Pearce’s web design workspace and for a fully functional watchmaker’s atelier. Visit us – we look forward to showing you all of this here in Lucerne!